Snow is still flying over most of the U.S. and Canada, but even in the worst weather we can still see and hear chickadees. Even on the coldest days of February these amazing little birds are already singing their spring song. Imagine weighing 10 grams--about the same as two quarters--and sleeping outside in the northern states and provinces all winter long, naked as a jaybird! Black-capped Chickadees do this without any problem. How is this possible? First of all, chickadees grow more feathers. A chickadee body is almost entirely covered with thick down feathers. Under this thick down jacket, a chickadee's body is even tinier than it looks. The down feathers provide insulation to hold the chickadee's body warmth inside. How does a chickadee's body get its warmth in the first place? 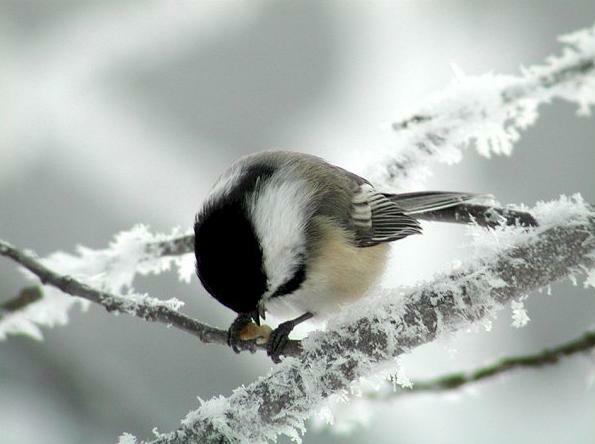 A chickadee can also increase its heart rate to help keep warm. The energy from its food gives the chickadee's heart the power to beat (over 600 beats every minute!) and its muscles the energy to shiver. All this heats up a chickadee body to about 104 degrees Fahrenheit, only millimeters from where the air temperature can be colder than 30 below zero! During the long, frigid nights of the northern winter, when chickadees can't eat, their bodies would quickly run out of energy to maintain a 104 degree temperature. And chickadees don't feel comfortable snuggled up to other chickadees, so they can't share their body warmth with one another. So when they go to sleep alone in their little cavities, they turn down their body thermostat for the night, allowing their temperature to drop over 20 degrees. At first light, they start shivering, and zip off to eat a frozen breakfast that will heat them up to face another winter day. 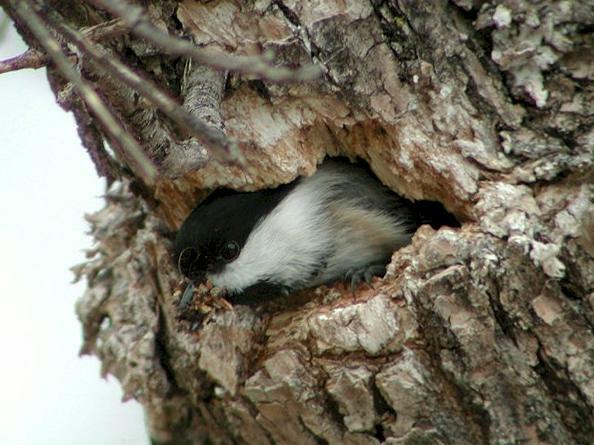 List as many advantages and disadvantages as you can think of for a chickadee to sleep in a tree cavity in winter. Daylength, temperature, and limited food all tell a chickadee that it's still winter. But they're already singing their spring song--a clear, whistled "Hey, sweetie!" or "Spring-time!" Why? Because it takes a chickadee pair a long time to cement their pair bond and become physiologically ready for the breeding season. They start singing in earnest in January, in February they sing more, and in March and April the number of songs goes up even more. During the next few months, go outside at the same time of day (preferably early in the morning) once a week and count chickadee songs for exactly 5 minutes. Graph your data with the date on the X-axis and the number of songs on the Y-axis. Take a Gander at Journey North's Chickadee Dictionary! Chickadees have many sounds besides their sweet spring whistle. The one they are most famous for is their "chickadee-dee-dee" call, but scientists have discovered at least 15 different vocalizations that Black-capped Chickadees can make. 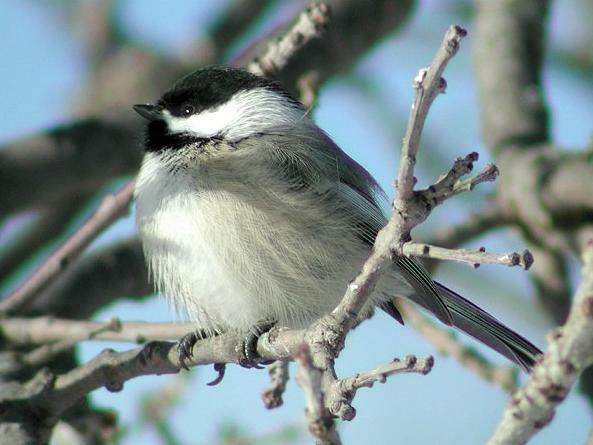 To learn more about chickadee sounds and their meaning (is this "Chicka-deese"? ), check out the brand new Journey North Chickadee Dictionary. You can find out what's going on in the chickadees' world if you know what the birds are saying and singing. NOTE: Be sure to see the Dictionary's link to a fun Chickadee Vocabulary Quiz that helps you test your "Chicka-deese" and get ready for the next challenge question! Copyright 2004 Journey North. All Rights Reserved.